Former England footballer Paul Gascoigne has been detained under the Mental Health Act following an incident at a Tyneside hotel. Northumbria Police said a 40-year-old man was detained at Gateshead's Hilton Hotel on Wednesday evening when concern was raised about his behaviour. 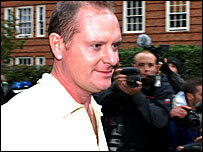 Mr Gascoigne had been asked to leave Newcastle's Malmaison Hotel earlier that day after a disturbance. Police said he was not in custody and was now receiving medical treatment. Mr Gascoigne is understood to have moved to the Hilton Hotel after leaving the Malmaison in the early hours of Wednesday. Northumbria Police confirmed a 40-year-old man had been detained under the Mental Health Act. A Hilton spokesperson said: "We can confirm that the guest in question checked into the hotel early on Wednesday 20 February. "While there was no disturbance caused (at the Hilton), we did receive a phone call from the police later that day. "Since then we can confirm that he was escorted calmly from the hotel and we are continuing to co-operate with the police." Mr Gascoigne has battled for some time with alcohol and health problems. In January 2005, he was hospitalised with pneumonia and last year he underwent emergency surgery for a perforated stomach ulcer after being taken ill as he was celebrating his 40th birthday. He was arrested for an alleged assault on a photographer outside a Liverpool city centre hotel in 2005. The charges were later dropped. A former player with Newcastle United, Tottenham Hotspur, Lazio, Glasgow Rangers and Middlesbrough, he was sacked after 39 days as manager of Kettering Town in 2005. He was capped 57 times for England.